The city of San Jose on Thursday could learn more about BART's plans for building a tunnel under the South Bay city as the transportation agency continues its expansion project. Bob Redell reports. The city of San Jose on Thursday could learn more about BART's plans for building a tunnel under the South Bay city as the transportation agency continues its expansion project. BART's Board of Directors is expected to discuss how to connect the yet-to-be-opened Berryessa Station with future stops planned in or near the downtown San Jose area. From the Berryessa BART station, the transportation agency will extend another six or so miles with stops in Alum Rock, downtown San Jose, Diridon Station and Santa Clara. The question at the table is how will BART tunnel underneath downtown San Jose. 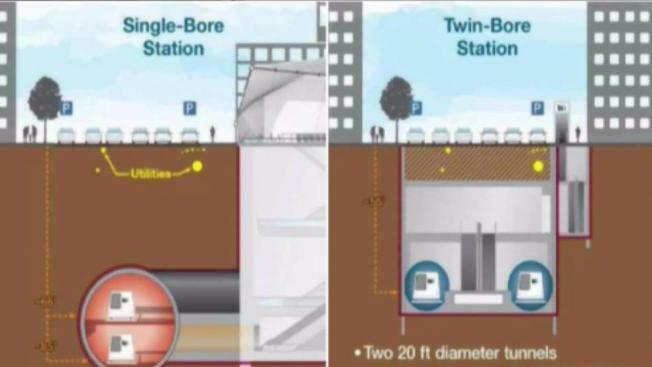 The transportation agency can either utilize a single-bore option — deeper underground tunnel with trains running above and below of each other — or go with a double-bore option — wider underground tunnel with trains running parallel to each other. Santa Clara Valley Transportation Authority, which is leading the project, favors the single-bore option. According to the Mercury News, VTA is asking for another three months to finish its design for a single-bore tunnel, which would measure about 45 feet in diameter. VTA prefers the single-bore option because it would only take three years and two months to complete, and it would be about $50 million cheaper than the double-bore option, which would take about four years to complete. BART's extension into San Jose and Santa Clara is expected to be completed by 2026 at a cost of $4.7 billion.